Summer asserted herself today. She blasted inland California with triple digits and greeted us this morning with nasty bug bites on my son’s leg and arm, an augur of the mosquitoes on standby. Ugh…here we go with the summer itching! To top it off, Tennyson was going ballistic over the red bumps that had swelled by late morning, when he suddenly held out a dark finger and started crying in the car. In less time than he could blink, he had paper-cut himself with a book he’d picked up. Blood oozed right along the edge of nail top and skin. The cut was deep. My boy sobbed and sobbed. Though I managed to stop the bleeding, it started up again when we got home. As I set about nursing the wounds, I decided to share with you a glimpse of my other life as Holistic Medicine Woman. 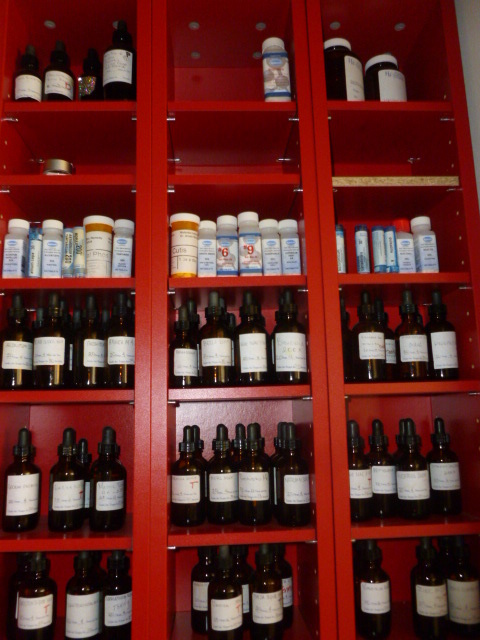 As you can see, my home apothecary carries herbs, homeopathics, and supplements. The photo caught just the top half; I couldn’t fit the length of the shelves into one shot. I have products in a kitchen cupboard and next to the bedrooms as well. Why I favor a holistic approach to health and healing is really another post entirely, one that’s been on the simmer the last few months. I will limit that discussion to its relevance to homeopathics. For now, I’d like to spotlight some natural first aid remedies, especially with pesky summer bites at hand. The following is not medical advice or even recommendation. I am only sharing what I use for my family and why. I get no kick-back from any of the companies and brands I’ll talk about. I am simply offering those who choose to read on a glimpse of some of the products I have settled on after – in some cases – years of studying the safety and effects on children, and examining fine-print inactive ingredients. The post would run too long if I described each product in full so please Google if you’d like more information on any of them. As the largest organ of the body, the skin helps eliminate waste through sweat. The porosity that releases toxins also absorbs them. What we apply on our skin is food – or poison – for the body, which the liver ends up trying to spit out of the system. A great rule of thumb in assessing the quality of a skin product is to ask whether you’d be able to eat it, at least in different form. I know, 99% of the products on the market apparently fail this test. Just giving you the ideal. Take it or toss, or take it and try. If I can’t pronounce or duplicate it, I don’t buy it or slather it on my son. To condense into a few sentences the subject of homeopathics that by nature will fill a book: homeopathy has its foundation in the law of Like Cures Like. The principle of vaccination actually springboards off the discovery of German physician Samuel Hahnemann from the late 1700s. He realized cinchona, the bark of a Peruvian tree, that incites symptoms of malaria could be used to cure those very symptoms in someone who already had the disease. This dynamic lies behind the now-popular encouragement of seasonal allergy sufferers to consume raw local honey. The honey that’s been pollinated can help cure sensitivity to pollen by repelling it out of the body. Western Medicine, which has influenced cultures beyond the West, views symptoms as something to battle, to silence. Hence the business of antibiotic, antihistamine drugs on the market. Holistic Medicine believes in listening to what the body is trying to express through the grievances we call symptoms. Manifestations are not the bad guys but the body’s attempt to rid what is toxic or cumbersome. A problem in one area actually has its roots in another since we are a unified composite. Which is why folks like me look at illness and even injury holistically, working to support the immune system to heal the body as a whole. Homeopathic products work with the body, not against. Medicinal drugs have their time and place. They have saved countless lives. But I feel they also are often used unnecessarily and their byproducts can render them counterproductive. I will share in the next post what I did to ease my little guy along today. This entry was posted in Holistic Health and tagged Children, Drugs, First Aid, Healing, Health, Herbs, Holistic Health, Homeopathy, Medicine, Natural Health, Parenting. Bookmark the permalink. At first I thought you meant natural remedies and the like. Ha ha ha. One tired mom here. Yes, it’s been a rough ride for the little man (and therefore, Dr. Mom). Thanks. I had never thought about skin products like that, but it makes perfect sense! Thank you so much for sharing that! =) People don’t seem to think much about what they put on themselves or their kids. I was hoping to be helpful. I had planned to visit again. I think for quite a few people it’s a price thing, too. I’d love to buy all organic, natural everything, but it’s not always possible. Def something good to think about and look into! That’s why I buy online (the sites I linked) and through co-ops. =) Affordable, esp for all the competition nowadays. That is why I developed my all organic, natural moisturizer–which you could eat by the way. 🙂 My youngest son had multiple food allergies including a very rare one to polyethylene glycol. This is a stabilizing agent that is found in almost everything. His needs drove me headlong into researching all the chemicals that are in most of our products, learning how almost 85% of what we slather on is absorbed into our bodies, and that a shocking number of common chemicals/preservatives are actually banned in Europe for their links to diseases such as cancer and autoimmune disorders. I started a life long pursuit in learning how to strengthen and heal naturally. . as well as developing the products I now offer. I have a great deal to learn and it is so exciting to “meet” someone that loves the same interests!!!!! Your son is so blessed. You are very kind. I think he would agree or disagree depending on how close the issue came to my last “no, you can’t…” lol!! !